Our apartments "Mölten" consist of a spacious living room with pull-out double bed, a double bedroom which is separated by a sliding door from the living room, a kitchenette, corner seat, satellite TV, Internet access (free Wi-Fi), shower, toilet two balconies with stunning views in the south of South Tyrol and the surrounding mountains (equipped with sun loungers, parasol and dining table). Towels, linens, dishes and towels supplied and exclude. On 35 m² can accommodate between 2 and 4 people. Welcome! Our house is located in the heart of South Tyrol Tratter. The very sunny village Schlaneid / Mölten is on a plateau between Bolzano and Merano (both cities in 20 minutes reachable) located at 1130m above sea level. 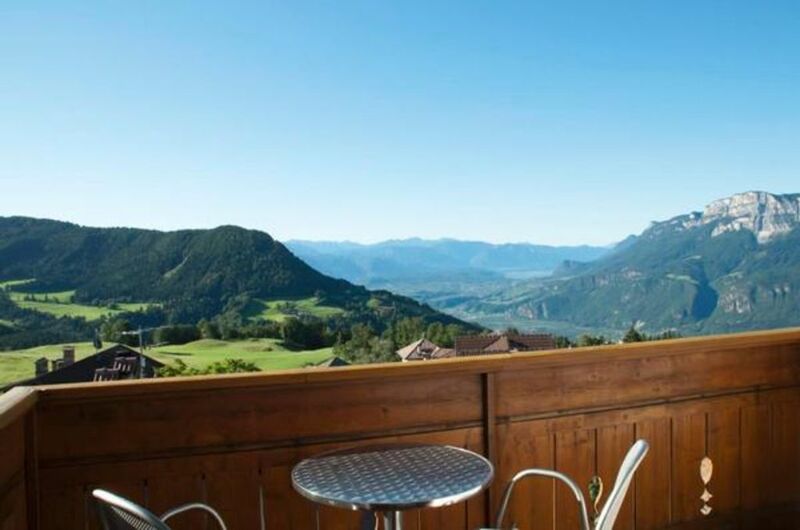 Holidays in Mölten means: u hiking paradise, mountains, alpine meadows, magnificent panorama, mountain farmers, tradition, custom, Haflinger horses, mountain biking, cultural and shopping trips to Bolzano and Merano V. M.. Grocery store and bus stop are in the immediate vicinity. Children we have a playground next to the house with table tennis and table football, swing and sandpit. Upon request, we also offer breakfast and the possibility of a delicious dinner in our family-owned guesthouse (300mt away). Cot (per object and day, included in the price 0 EUR). Extra bed (per object and day, included in the price 0 EUR).